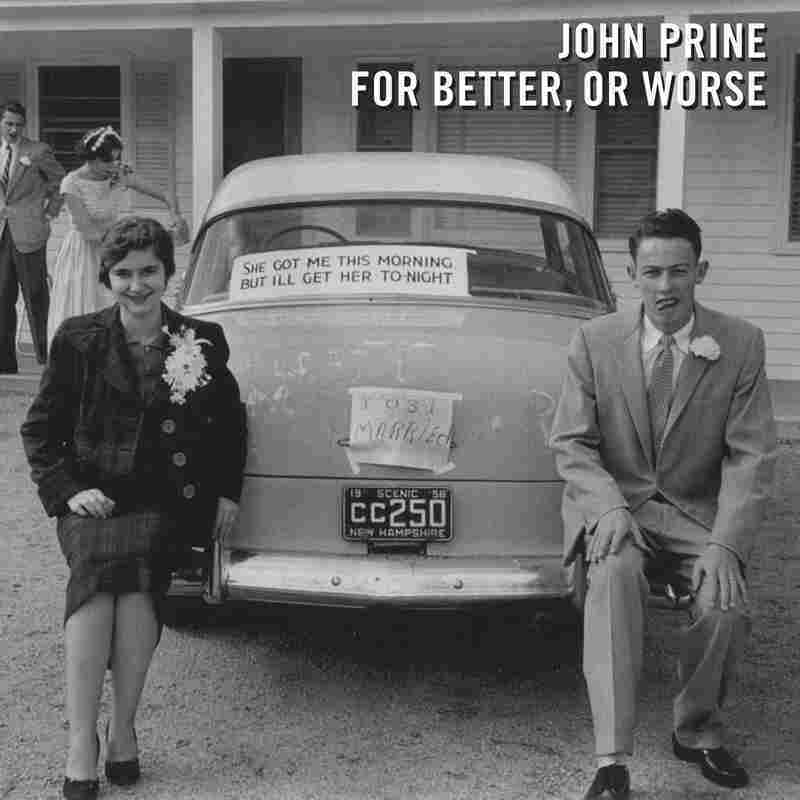 Review: John Prine, 'For Better, Or Worse' On the cusp of his 70th birthday, the revered singer-songwriter sets down his pen to explore country classics with some stellar duet partners. With nearly seven decades in the rearview mirror and some of the finest songs in the English language under his belt, John Prine can do whatever tickles his fancy. As septuagenarian status looms, the celebrated singer-songwriter's muse has moved him to release an album of country duets. For Better, Or Worse, which finds Prine teaming with an all-star array of female singers to tackle carefully chosen vintage country tunes, isn't Prine's first such recording. In 1999, after his first bout with cancer, he recorded the similarly styled In Spite Of Ourselves. Seeing as how For Better, Or Worse is Prine's first album since emerging victorious from his second struggle with the disease, it seems he finds spiritual sustenance in singing his favorite old country songs with some gifted distaff duet partners. While some older artists use duet albums to sidle up to a strategically selected batch of stars in an attempt to make themselves commercially relevant again, Prine operates outside of such concerns. He's been recording for his own label since the '80s (long before that level of independence became commonplace) and answers to no corporate paymaster. Just as he does with everything else, it's clear that Prine put together his wish list of collaborators for this project based on his own artistic inclinations. Iris DeMent and Fiona Prine return from In Spite Of Ourselves, but otherwise it's a fresh crop of singers. A couple of them — Miranda Lambert and Kacey Musgraves — are the toast of today's Nashville scene. But most of the others are either on the underdog side (Morgane Stapleton, Amanda Shires) or respected vets whose authenticity has outlasted their mainstream marketability (Kathy Mattea, Lee Ann Womack). There have always been country shadings to Prine's work, and the influence can be traced back to his Kentuckian father, who loved Hank Williams and passed that passion on to his son. Prine's very first review — written for the Chicago Sun-Times in 1970 by none other than Roger Ebert, who was so wowed by the singer that he temporarily abandoned his film beat — referenced Williams, as well as Prine's "ghost of a Kentucky accent." Prine closes some kind of circle here by singing with Hank's granddaughter Holly Williams in "I'm Telling You," which her grandmother Audrey Williams used to perform as part of Granddad's show. The original version, sung solely by Audrey, was a wife's warning to her wayward husband, but by turning it into a duet, Prine and Williams make the implied marital transgressions a two-way street. Unsurprisingly, he sounds comfortable and unassailably natural cavorting with country royalty. Cancer treatment and the plain old passage of time have colluded to deepen and coarsen Prine's already agreeably rough voice, but that only enhances the guy-next-door relatability his delivery has always possessed. Besides, he opens up the album by picking up Ernest Tubb's equally knotty vocal mantle in the scrappy honky-tonker "Who's Gonna Take Your Garbage Out." Originally cut by Tubb and Loretta Lynn, it's a classic nagging wife vs. philandering husband duet. When Prine and his old pal Iris DeMent have at it, framed by an appropriately old-school arrangement, you can almost see the sparks fly along with the invective. In the album's youngest song, Prine and Morgane Stapleton (best known as the vocal partner of her husband Chris) repurpose another solo setting, Vince Gill's 1991 hit "Look At Us," as a vehicle for two voices. The pair play a happy couple who have no qualms about holding up their relationship as an example of what a successful love story looks like, and the luminous vocal chemistry between Prine and Stapleton amid the swooping pedal steel makes you believe it. It's tough to imagine two more different-sounding voices than those of Prine and Alison Krauss. Yet when the bluegrass queen's honeyed soprano glides gracefully around Prine's rough-and-tumble tones in the delicate waltz-time dance of the '30s standard "Falling In Love Again," these polar opposites complement each other perfectly. In the second of the record's three Hank Williams songs, "Cold, Cold Heart," Prine and Miranda Lambert turn a similar trick to the one he and Holly Williams manage in "I'm Telling You." One of the most ubiquitous country standards ever written, the despairing ballad of a romance on the rocks has always been delivered as one singer's message of melancholy to an emotionally distant lover. When Prine and Lambert team up, the tune becomes a different beast: a chilly account of two people unable to get within arms' length of each other's hearts. Whether he's interpreting songs of domestic bliss or emotional apocalypse, Prine relies on the same qualities that serve him well with his own compositions. He's got a knack for delivering a lyric with unassuming succinctness that can put the weightiest statements across with remarkable ease. Everything that comes out of his mouth feels like a well-worn but treasured old anecdote shared between trusted friends or family members. And the tracks on For Better, Or Worse are no exception. But Prine saves the most emotionally honest moment until almost the end of the album. The standard "My Happiness," a song about the same age as the singer himself, is performed with his wife of 20 years, Fiona. For John, the third-time's-the-charm marriage has clearly been one of his life's greatest boons. When he and Fiona, who is not a singer by trade, join together for the song's simple, timeless evocation of deep and abiding love, it's like listening to the couple renew their wedding vows in public. Prine hasn't offered up a new batch of original songs since 2005's Fair & Square, and since he made his name as one of America's most powerful post-Dylan songwriters, it would be hard to blame fans for wishing he'd pull out his pen again. But for whatever reason, songwriting doesn't seem to be where the Midwestern bard is at these days. All things considered, we should just be glad he's still among us — and still making honest, emotionally impactful music, just like he's always done.